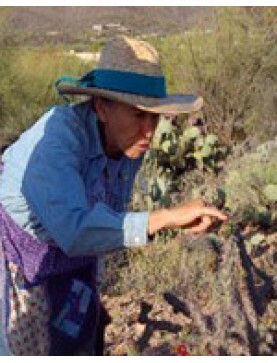 Inspired by Tohono Odham elders, Martha Burgess teaches ethnobotanical workshops in desert foods, herbs, and culinary ways. Working through Native Seeds/SEARCH and Baja Arizona Sustainable Agriculture, she is a strong advocate for growing our own food and medicines. Martha is also a talented watercolorist,who came to art as a special way to appreciateand understand Nature and history. Her background in geology, tree-ring dating, ethnobotany, andenvironmental education have given her a scientists wish for rightness in her artistic documentation, anadventurers sense of freedom about it, and a teachers wish to share it.